Beaches, rivers and even pools can present challenges for your feet - from slippery, moss-covered rocks to broken glass and sizzling concrete. 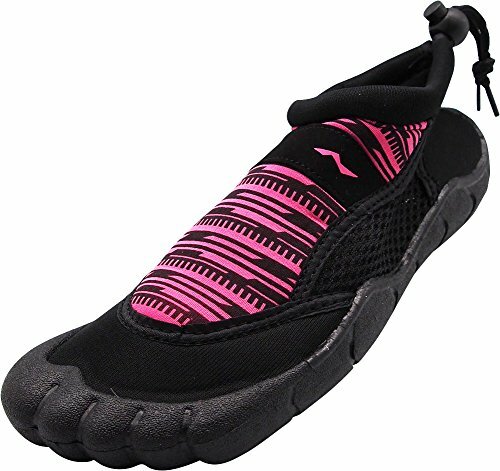 Norty Womens Aqua Water Shoes keep a low profile while providing excellent traction and maximum protection from unexpected underwater hazards. If you love to be active in the water, whether swimming, surfing, snorkeling or whitewater rafting and kayaking, you'll appreciate how the Norty Water Socks hug your feet. Breathable mesh allows water and air to flow freely - which helps the shoes dry fast. Stretchable neoprene uppers provide a protective layer but are easy to slip on and off even when wet. You won't have to worry about your aqua socks flying off your feet at inconvenient times when you're navigating fast-moving water or running along the beach. The drawstring cord style cinches tight and provides a secure fit or the strong fabric closure style keeps your shoes in place no matter what the circumstance. SECURE FIT: Styles come with either an Adjustable Drawstring Cord or a Strong Fabric Closure. Easily secure your aqua socks with the adjustable drawstring tight cord or the strong fabric closure - either way they won't come off your feet until you take them off. Comes in 10 popular color combinations.